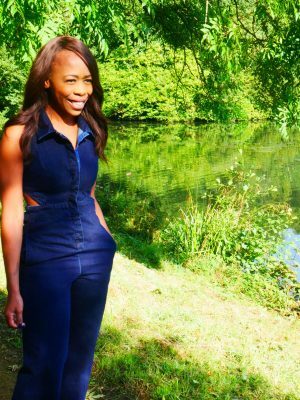 I’ve been thinking about my favourite styles and it led me to realise that the jumpsuit is right up there as a wardrobe staple and got me to thinking that every wardrobe needs at least one jumpsuit! If you’ve been following along for a while, you may have noticed a recurring style theme from the post to the post to our YouTube lookbook and that is the jumpsuit. It’s not on purpose, but most likely because jumpsuits are the easiest thing to wear and look stylish with very little effort. Which is definitely where I firmly stand, sartorially speaking! You don’t have to worry about mixing and matching, or (gasp) ironing more than one item, because they’re all there in one handy throw-on piece. Even though the name sounds terrifying, I’ve been a fan of the tailored playsuit for a long time (a long time! ), but I’ve drifted away from the playsuit (even with tights) and fallen head over heels for the jumpsuit. I think they suit my style so much more now and I just find them so easy to wear. There are so many styles out there to suit every shape and style and I have seen women of all those shapes and styles rocking them and looking bloody marvellous. 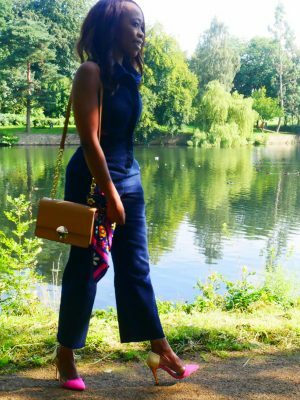 So, I thought it was time to do a post dedicated solely to why you should love the jumpsuit! This jumpsuit. The shoes, the tan bag is New Look. See the whole look in our YouTube designer dupes shoe haul. I have lots of ideas of jumpsuits for breastfeeding, for work, for an evening out, heck just for jumping about with the kids. And, you know what, there are loads with sleeves and gorgeous embellishments out there to not only fit perfectly for the festivities on the way, but to also cover the bits we like the least in a very stylish way. What I love is that you can dress them up with heels or down with flats and trainers. The possibilities are there for the taking, no matter what your style! Fabrics are so diverse these days and as someone who is not a massive fan of jeans, mainly because I rarely find a good fit, I don’t tend to go for denim a lot. I’ve tried several dungarees, but I’m yet to settle on a pair I like, that don’t make me feel like a teletubby! But, I love this indigo denim number as it’s such a good base colour, which looks great with heels of any colour. Plus, the cut outs give it a little extra pizzaz for night time. I’ve worn it twice and was stopped a lot and asked about it. The fabric is super thick, with lots of details, so you wouldn’t know I paid £13.50 for the petite version ( petite and standard now £15.50). However, it does have press studs, and they do sometimes pop, so be warned if you have a little bit extra on top! Be bold with cut outs – the trend seems to be growing and you could see it all over London Fashion Week. I like the style and I have to say, when you find the right style, it’s so much more wearable than it seems. I like my arms and back and my legs less so, so the denim one is perfect for me. So, you can experiment with what you reveal and what you cover, whether that be legs, tummy, back or shoulders. I really love the wide leg or culotte styles as they give a flattering shape to the legs and waist because of the way they skim from the hips. A complete win for me! Plus, if you’re small like me, the culotte style is great as you don’t have to worry about the length. I pair mine with flats or heels depending on what I’m doing. The same jumpsuit can look so different, depending on accessories. Shirt style or button down are fabulous for looking chic. They add that extra detail and are so perfect for breastfeeding. Another style you can dress the style up with flats or heels for work and they also look great with a tailored jacket. I bought this one from New Look and talked about it in the post: The Culotte Jumpsuit, and it was also in our YouTube Lookbook. Sleeves are big right now. I mean in a fashion sense and also in size. I am talking, the bigger the better. It’s up to you how big you go (and I’ve seen big! ), so they’re perfect not only for this time of year, but if you want to cover a little more. Batwing styles are great are a great way to wear a sleeve because they float over your arms for a really flattering shape. I picked up my floral batwing one (pictured) in the La Redoute sale for £8.70! An absolute steal. I love that it has pockets and it also has a press stud to stop the v-neck from flapping around. No wardrobe malfunctions on this one! The pinafore style is massive and it’s not hard to see why – it’s a flattering neckline and you can layer it up for the colder months. 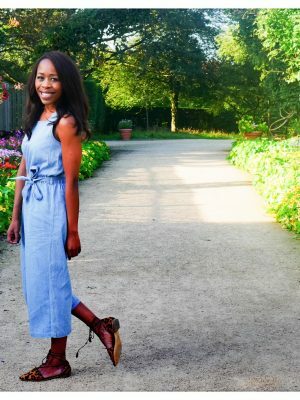 You already know about my favourite one that I picked up from the M&s kids sale for £12 because I wrote about it here: M&S Kids Pinafore Jumpsuit. But, there are loads of adult versions too. So, if you’re petite, don’t be afraid to raid the kids’ section, there are some great finds to be had. I’ll be pairing it with a roll neck, tights and longer boots underneath for Autumn/Winter. For the evening, look for extra detail or options to add detail. Embroidery is still going strong. I like the idea of adding a lace or an embellished sleeve or detail to give it a little extra oomph. It’s a great way to cover up without feeling frumpy! You might well have noticed that these photos were taken when the UK weather was just a little bit warmer! 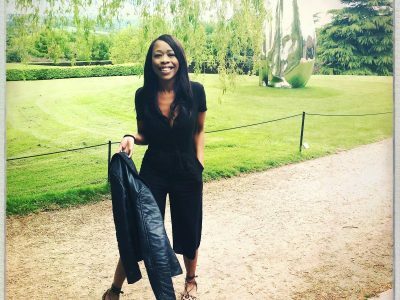 But, jumpsuits are pretty easy to transition if the weather is cooler, with layering, so definitely don’t be scared to pick up a ‘summery’ one in the sales. Just add a polo or turtle neck and a leather jacket and even a mac would look great with a pair of boots and you’re all set! I’ll be posting soon on my transition wear staples. Do you wear jumpsuits? If not, why not! :o). I hope you’ve been a little inspired if you don’t. If you do, I’d love to know where you’ve found any favourites. You are looking stunning in this jumpsuit. I always prefer jumpsuits as we can wear them at any time of the day like during lunch and even at night when you want to go out for that long drive. The main driving factor of the jumpsuits is that they are convenient and you do not have to think about coordination as they are in the single piece, only accessories like shoes, bags and jewellery need to be counted. Keep sharing. I love jump suits but sadly I can't wear them because at just 5ft2" they are all way too long on me and I can never find any in the petite range. It's the same with maxi dresses. #shortgirlproblems :-( (UnhingedMummy stopping by from #coolmumclub). I like jumpsuits but only have a few. I need to buy some more next summer. I love jumpsuits like the next person but I dont like wearing them around this time of year because I will freeze. lol but I love this jumpsuit and its great style.